Kant deplored inclination — either internal or external pressures on the will, and instead described the path to and from Reason, as the path to real freedom. 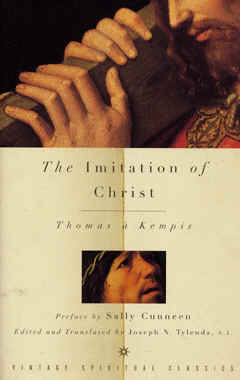 Kempis seems to somewhat share that analysis — that obeying our “carnal” desires (internal inclination) or things that are “without” (external inclination) weighs us down with disappointments and condemnation. The path to peace, however, is not obeying Reason, but in obedience to the Spirit. To the Enlightenment philosopher, Reason is what makes us truly human; therefore we need to shun all inclination and live as perfectly rational human beings. To the contemporary individual, what makes us truly human is Passion (e.g., I should do what I ‘really want’ because my desires are inherently good, they come from who I really am, and unless I obey my passions, I will not truly become my true self). But from the perspective of Scripture, what makes us truly human is the Image of God; and unless we can resist our fallen inner desires as well as the external pressures to conform — and instead listen to the voice of God in whose image we are made, and in the example of Christ — who showed us what it means to be truly human — we will always be less than the people were were made to be. → Children: To have or not to have. Is that the question? ← 3 Kids More Expensive Than I Thought?